Nearly everyone has experienced the frustration of running out of propane while cooking on a grill, running a generator or using a lantern. At Northwest Propane, we are more than the best Dallas propane supplier. We also strive to help our customers learn about propane, including how to tell how much propane is in the tank, so that our customers can always be prepared. Knowing how to tell how much propane is in the tank is as easy as a knowing how to do a little bit of simple math. Located on the side of every tank of propane are the letters TW, which is followed by a number. TW means tank weight, and it gives the weight when the gas tank is empty. Write down this number for later. Use a reliable scale to weigh your propane tank. Subtract this number from the TW number to get the approximate weight of any gas that remains within the tank. Since every pound of propane has 21,600 BTUs, in order to find the total number of remaining BTUs, multiply the weight of the remaining gas by 21,600. To find how much longer your tank has before dying, you need to determine the BTU output of any appliances that will be used. This information is usually easily located on the appliance manufacturer’s website. Divide your tank’s remaining BTU amount by your appliance’s hourly BTU consumption to get your number of remaining hours of propane when used by that appliance. 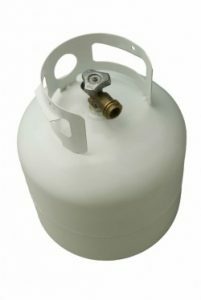 Learning how to tell how much propane is in the tank may not solve your propane problems. Contact a Northwest Propane technician today at 972-247-6121 with any other questions you may have.